What is Bee Propolis with Echinacea? Prized for its antiviral, antibacterial, antiseptic and antifungal properties; 100% lab tested, fast absorbing, liquid Bee Propolis Spray is also rich in bioflavonoids and provides antioxidants and nutrients for the maintenance of good health, and has been combined with Echincea pupurea for added immune boosting benefits. 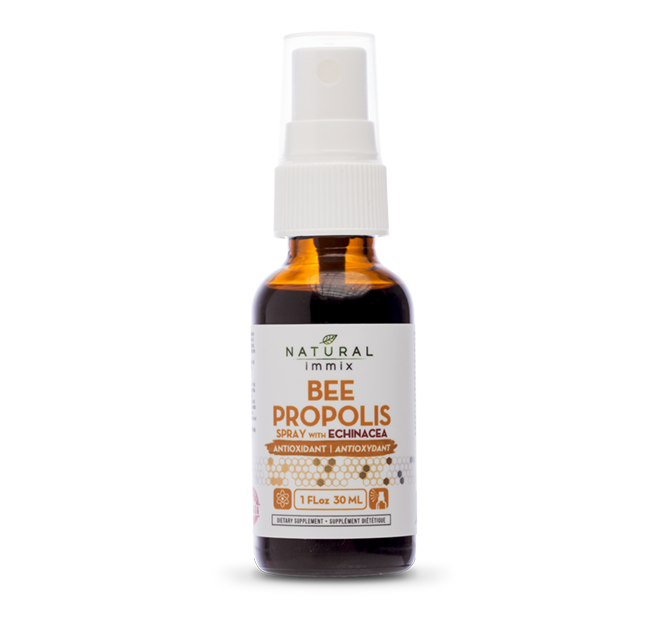 Why Bee Propolis Spray with Echinacea? Its impressive antiviral, antibacterial, antiseptic and antifungal properties are some of the main reasons that Bee Propolis has been extensively researched and used as a natural health product dating back to 350 B.C. Bee Propolis: is the strongest antibiotic found in nature. Unlike many antibiotics, Bee Propolis is exceedingly safe and does not destroy good, beneficial bacteria along with bad bacteria and has no known side effects, contraindications or upper limits of ingestion. Bee Propolis does not cause the body to build up a tolerance over time, meaning it can be used regularly without losing effectiveness. It is useful for canker sores, sore throats and infections caused by bacteria, viruses, fungus, and single-celled organisms called protozoans. Bee Propolis is also helps boost the immune system and can improve gastrointestinal (GI) problems including Helicobacter pylori infection. Bee Propolis is an antioxidant and anti-inflammatory agent and it can be applied directly to the skin for wound cleansing, for cold sores, as a mouth rinse for speeding healing following oral surgery, and for treatment of minor burns. Bee Propolis has also captured the attention of those wanting to enhance their overall, general health because it contains many nutrients such as protein and amino acids, trace minerals - magnesium, calcium, phosphorus and potassium - plus antioxidants such as beta carotene and bioflavoniods, as well as vitamins B1 and B2. Echinacea: is a herbal supplement that is commonly used either at the first signs of sickness (in an attempt to accelerate the rate of recovery) or daily as a preventative supplement in persons who are sick frequently (in hopes of reducing the frequency of which they get sick). The term 'Echinacea' refers to a genus of plants and a few species in this family including purpurea and augustifolia are desired due to their alkylamide content (seen as the active ingredients). Echinacea helps fight off infections and alleviate symptoms associated with the upper respiratory tract such as throat sinus and bronchial irritations.